This past weekend saw Doctor Who kick off its Series Finalé with the shocking reveal of antagonist Missy's true identity - except I wasn't really left shocked by it, just kind of disappointed. Oh, Doctor, why can't you try something new? 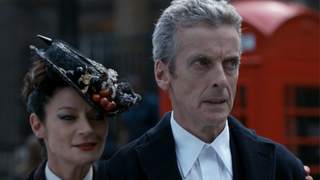 Warning: This post features MAJOR SPOILERS from the latest episode of Doctor Who, Dark Water. If you've not seen it yet, don't read any further! I largely enjoyed Dark Water as I sat down to watch it this past Saturday, but the slow build up of The Doctor and Clara meeting Missy for the first time, to the big cliffhanger reveal that she's not just behind the Cybermen's latest invasion of Earth, but also a new regeneration of The Doctor's archnemesis The Master, left me feeling cold. As a dyed-in-the-wool Doctor Who fan, I probably should've been bouncing off the wall - The Master! Not seen in four years! Hooray! - but all I could think about as the credits rolled was simply 'why couldn't she just have been a new villain?'. Now don't get me wrong - I love the idea of a female Master, as well as its subtle-as-a-brick-to-the-face statement that if The Master can be a woman, so can The Doctor. Michelle Gomez is a fabulous actress, and I'm sure she will do the character's legacy a great service. My growing problem with Doctor Who is with its increasing reliance on its own History for stories, instead of forging ahead with new ideas, new characters and new villains. Doctor Who's lengthy history is both a blessing and a curse - so few other shows can claim to be over 50 years old and still on the air (well, let's ignore that empty bit in the 90's for now), and if offers an immeasurable treasure trove of ideas and characters to mine. But at the same time, such over-reliance on days gone by leaves the show in danger of repeating itself a bit too often - something that's starting to show a little too often in NuWho. Back in the 80's under John Nathan Turner, Doctor Who got steadily more insular in an attempt to treat its diehard fans. More references, more returning monsters and characters, it all served towards the show's eventual stagnation. I'm not going to fearmonger and say that this is what's happening here, if anything Who is as strong under Capaldi than it ever has been, but it's hard not to see the parallels forming. Doctor Who thrives on fresh ideas, and it feels like it's starting to lose that sheen a little every time it navel gazes or brings back an old villain. It feels stranger for all this familiarity considering we're coming off the back of a nostalgia-filled 50th Anniversary last year. Part of the the impetus of the 50th celebrations was while the show would look to its past - completely acceptable, self-indulgence at such an event should be encouraged - but that the show would look to its future, the search for Gallifrey symbolic of that approach. And yet... nothing. The show has trod familiar ground over the course of series 8, culminating in the return of three of the series biggest villains. If this had been last year, it would've been understandable, now that the party's over, should the show not look to be creating new icons, new characters that can stand the test of the next 50 years? That's not to say that Series 8 hasn't been trying new things. The more abrasive Doctor, the huge emphasis on (and improvement of) Clara's character arc have felt like subtle seas of change for at least the revived version of the show, if not in comparison to its whole. Flatline itself as an episode perhaps galvanised those to approaches the most, delivering not just one of the best episodes of the show in a while, but a fresh approach to twisting the format to give us something a little new - and it was invigorating. Coincidentally, it also happened to be from Jamie Mathieson, a writer completely new to the show in series 8. It's the sort of approach Doctor Who needs to start taking more often, both on the screen and behind it - new monsters, new approaches, new writers. The show needs these new ideas to maintain itself and provide a new basis to build the next era of it's legacy on, instead of returning to the Cybermen and The Daleks and The Master, again and again. It's why I think, for a good long while at least, the show needs to jettison its past. No references. No old monsters. Just The Doctor, his Companion, the TARDIS, and pastures new. Liberated from the chains of its past, the show could dare to try new things, shake it all up a bit. What make Doctor Who so brilliant is that it can be so many different things. week in week out. Its format is such that it changing things up all the time is something that sits at the core of the show - the main character can literally become a completely new person every few years. It's high time Doctor Who as a show tried doing that again, instead of relying on new faces over old ideas.